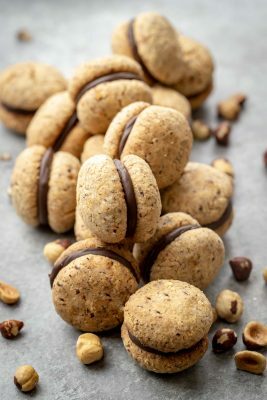 Italian Cookies Baci di Dama are made with two melt-in-your-mouth hazelnut cookies which are held together with some good dark chocolate. Line 2 baking sheet pans with parchment paper, set aside. Pulse the hazelnuts in a food processor or a coffee grinder until mostly flour-like with some pieces that still retain texture. In a large mixer bowl whisk together ground hazelnuts, flour, sugar, cornstarch, and salt. Add the cold cubed butter, vanilla extract and mix until a dough forms with no visible butter chunks. Using a small ice cream scoop, portion the dough into about 2 teaspoon chunks, then roll each one into a ball. Set Italian cookies onto the prepared baking sheet about 1.5 inches apart. Slightly tap on top of each hazelnut cookie ball to flatten. See *recipe notes* for how to shape and bake smaller sized cookies. Chill cookies in the fridge for 1 hour. About 45 minutes into it, preheat the oven to 325 degrees with the baking rack in the middle. Bake cookies for about 17 to 18 minutes, or until just starting to brown on top. Remove from oven and cool completely. In a microwave-safe bowl, microwave the chocolate chips in 10 to 15-second intervals, stirring occasionally until the chocolate chips have melted half way (about 2 minutes). Then, continue stirring until the rest of them have melted completely. Spread 1 teaspoon of melted chocolate onto the bottom half of the cookies. Cover with the other half and press to adhere. Allow to sit undisturbed until the chocolate has set, about 30 minutes. Replace the all-purpose flour (1 cup) and the cornstarch (4 Tbsp) with the same amount of rice flour (1 cup 4 tbsp). Start out with 2 cups of whole hazelnuts and grind them yourself, or replace whole hazelnuts with the same amount by weight (240 g) of hazelnut or even almond flour. Cut the dough into 8 pieces and refrigerate. Remove one piece of dough from the fridge and roll it out to about 10-inch long rope, next cut it into about 10 pieces. Roll each piece into a marble sized ball. Reduce baking time to about 10 minutes. Fill with only about 1/2 a tsp or less of chocolate.